Create yourself a cape perfect for the office, for shopping or whatever you have to do! The Nordic Cape is feminine, cozy and comfortable; just what you need. The Nordic Cape is a crochet pattern that ingeniously creates a button bar that is permanently attached on one side. This a perfect pattern for beginner crocheters who want to learn and practice some simple shaping and lacework. Using stitches you know already, I guide you through the simple lacework around the hem. Full written and pictorial instructions included so that you will successfully create the Nordic Cape for you and your loved ones. The Nordic Cape Crochet Pattern has been tested by independent crocheters (some of their amateur photos are in the gallery). 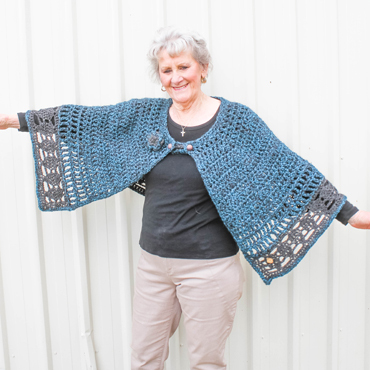 Nordic Cape Crochet Pattern is provided in both US and UK/AU versions, with step-by-step instructions and photos to help guide your hook to completion.